For the updated PS2, Xbox and PC version, see Sonic Mega Collection Plus. 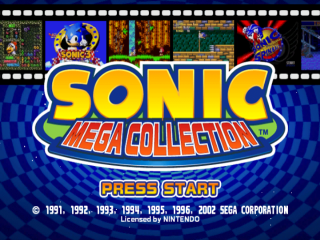 Sonic Mega Collection (ソニック メガコレクション) is a compilation of all Sonic the Hedgehog games for the Sega Mega Drive, released for the Nintendo GameCube. The games are reproduced by a Mega Drive emulator developed under the supervision of Sonic Team themselves. The collection also features high resolution instruction manual and comic book scans. An updated version, Sonic Mega Collection Plus, was released for the PlayStation 2 and Xbox in 2004, and Windows PCs in 2007. The two games released for hardware add-ons to the Mega Drive—Sonic the Hedgehog CD for the Mega CD, and Knuckles' Chaotix for the 32X—were not included in either the original or Plus version, due to emulation issues (and not size constraints as some believe). The former would later be successfully implemented in Sonic Gems Collection, though the latter remains officially available on its original hardware only. The compliation also contains the first official name to the secret unlockable game accessed by combining Sonic & Knuckles with Sonic the Hedgehog 1 using lock-on: It was listed as Blue Sphere. This game marks the first appearance of Cream the Rabbit, artwork of whom can be found in the extras section. 3.1 IN COOPERATION WITH VR1 JAPAN, Inc.
3.4 SEGA OF AMERICA, Inc. Compiled Under The Supervision of SONICTEAM, LTD. IN COOPERATION WITH VR1 JAPAN, Inc.
Comics Provided by Archie Comic. NOTE: The following sales data comprises of sales of Sonic Mega Collection Plus in addition to sales of Sonic Mega Collection. 1,440,000 The Magic Box - US Platinum Videogame Chart (as of 2007) PS2 US "
This page was last edited on 10 April 2019, at 13:36.